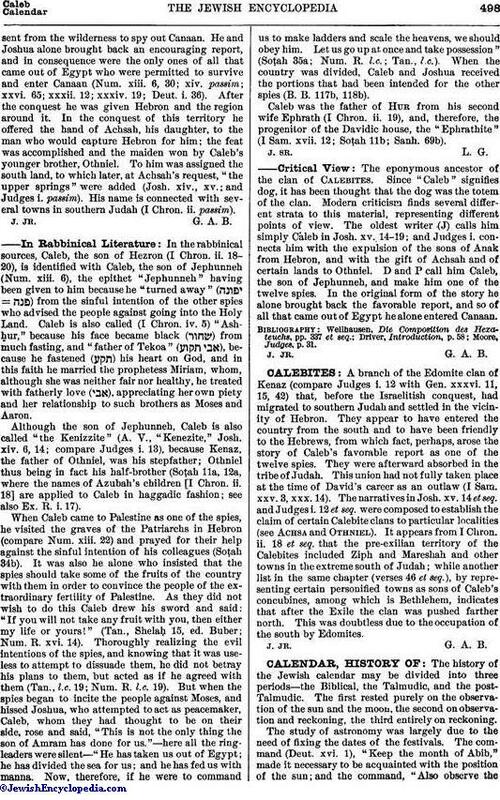 According to the Biblical text, Caleb was of the tribe of Judah. He represented that tribe among the twelve spies whom Mosessent from the wilderness to spy out Canaan. He and Joshua alone brought back an encouraging report, and in consequence were the only ones of all that came out of Egypt who were permitted to survive and enter Canaan (Num. xiii. 6, 30; xiv. passim; xxvi. 65; xxxii. 12; xxxiv. 19; Deut. i. 36). After the conquest he was given Hebron and the region around it. In the conquest of this territory he offered the hand of Achsah, his daughter, to the man who would capture Hebron for him; the feat was accomplished and the maiden won by Caleb's younger brother, Othniel. To him was assigned the south land, to which later, at Achsah's request, "the upper springs" were added (Josh. xiv., xv. ; and Judges i. passim). 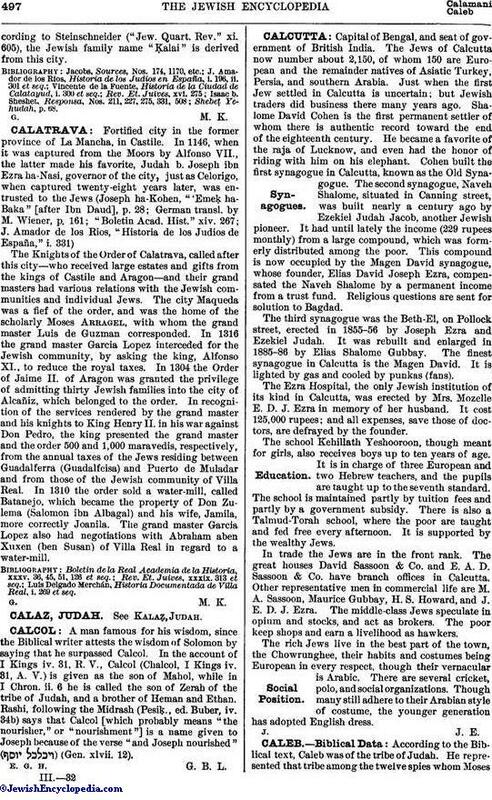 His name is connected with several towns in southern Judah (I Chron. ii. passim). In the rabbinical sources, Caleb, the son of Hezron (I Chron. ii. 18-20), is identified with Caleb, the son of Jephunneh (Num. xiii. 6), the epithet "Jephunneh" having been given to him because he "turned away" ( = ) from the sinful intention of the other spies who advised the people against going into the Holy Land. Caleb is also called (I Chron. iv. 5) "Ashhur," because his face became black ( ) from much fasting, and "father of Tekoa" ( ), because he fastened ( ) his heart on God, and in this faith he married the prophetess Miriam, whom, although she was neither fair nor healthy, he treated with fatherly love ( ), appreciating her own piety and her relationship to such brothers as Moses and Aaron. Caleb was the father of Hur from his second wife Ephrath (I Chron. ii. 19), and, therefore, the progenitor of the Davidic house, the "Ephrathite" (I Sam. xvii. 12; Soṭah 11b; Sanh. 69b).